Please help our community — upload your photos of 6J1941531AN. This is a multiple switch f.side lights,headlights and fog lights for Seat vehicles. It fits for Seat Ibiza, ST for Spain. 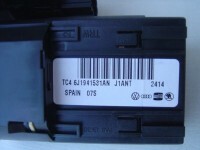 It's a genuine VAG part with an OEM part number 6J1941531AN. This multiple switch f.side lights,headlights and fog lights has manufacturer's warranty and 100% fits for Volkswagen Group cars. It's made of , it has passed not only all manufacturer's tests but also Volkswagen Group quality control and has to endure rough road conditions over a long time. In spite of higher price of genuine parts buying VAG (VW) genuine multiple switch f.side lights,headlights and fog lights will be a smart decision, because you will be absolutely sure that VAG (VW) genuine multiple switch f.side lights,headlights and fog lights will serve you longer and will provide maximum safety and performance.